Charming barn conversion set in extensive grounds in this delightful corner of rural Norfolk - only five miles from the traditional seaside town of Cromer. Sleeps 4/6. £248 - £576 / week. 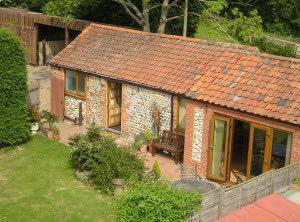 Tanglewood Cottage is a charming self-contained two-bedroom barn conversion sleeping four. The cottage was recently converted from an early 19th century brick and flint single-storey dairy, standing in the grounds of the owners� grade II listed farmhouse. It has been decorated to a high standard and provides modern co-ordinated accommodation but within a traditional setting. All rooms have beamed and vaulted ceilings with wood floors and rugs in the living areas. All windows are double-glazed. The bathroom is � tiled with modern low-level suite, ceramic tiled floors, thermostatic shower over the bath and shaver point. The open-plan living and dining area is spacious and inviting with contemporary furniture, including a metal-framed double sofa bed that can provide additional accommodation if required. The galley-style kitchen area is well-equipped with a range of modern wall and floor units. There are two colour co-ordinated bedrooms, one having a double bed and the other with two full-size single beds. Each bedroom has wardrobe hanging space and drawers. "A very relaxing holiday - so close to the beach. We enjoyed the cottage and will most certainly reccommend the cottage to our friends and family. the home made cake was delicious. A very warming welcome." "A wonderful and cosy cottage. Tanglewood seemed to neet all our needs. We loved Cromer, Norwich and Yarmouth. The anilmals were also a pleasure to meet as they are very people friendly." "A fantastic holiday. Very nice place to stay. Been to Norfolk for the last eight years and this was the best holiday yet and once again a scorching week in the sunshine. Will see you next year as we will be coming back." 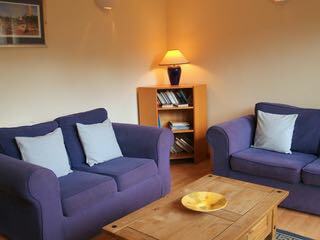 "Another fabulous holiday at Tanglewood Cottage. Thanks Paula and Keith for making us very welcome into your beautiful home. We have had a great time in North Norfolk - coming back to Tanglewood each day is the Gem ! See you again soon." "Tanglewood was a home from home. Could imagine living here permanently. Very nice site with a very nice family running it. Hope we can come back in the future."